The Israeli state ‘warehouses’ Palestinians in Gaza for many of the same reasons that the United States has historically incarcerated a disproportionate amount of African Americans. 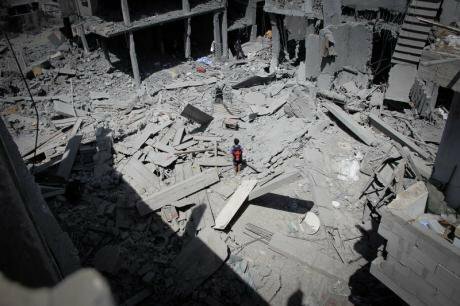 Beit Hanoun, Gaza Strip, after an Israeli air strike in 2014. Ahmed Hjazy/Demotix. All Rights Reserved. In her seminal book, The Shock Doctrine, Naomi Klein described the geopolitical situation in Israel and the Occupied Palestinian Territories as “a warning to the world”. This warning was of a creeping ‘disaster apartheid’ characterised by safe ‘green zones’ which look like Israel, and militarised, disaster-stricken ‘red zones’ which look like Gaza. When Klein wrote The Shock Doctrine in 2007, Israel had just pulled out its ground troops and settlers from Gaza following Hamas’ election to the Palestinian Authority in 2006. The land, air and sea blockade of the densely populated Gaza Strip, which is home to 1.8 million Palestinians, 80 percent of whom are registered refugees, had just begun. Since 2006, Gaza has suffered four large-scale military attacks, leaving thousands dead, many more thousands injured, bereaved, and destitute. In 2009, Israel’s Operation Cast Lead destroyed 80 percent of the Gaza Strip’s civilian infrastructure. Reconstruction, largely paid for by EU and US aid, has been difficult and slow, as each subsequent military attack has put waste to previous effort. The World Bank announced on 22 May 2015 that Gaza’s economy was on the verge of collapse, with 43 percent of residents unemployed and 40 percent of Gaza’s population considered living below the poverty line. What makes the situation even more desperate is that 44 percent of Gaza’s population is under the age of 14. The situation is worsening, and with Gaza’s borders closed to trade and population movement heavily restricted increasing numbers of people are attempting perilous journeys across the Mediterranean. On the other side they find themselves face to face with Europe’s hostile and unwelcoming borders. Israel’s economy, on the other hand, has steadily grown since 2006 and Israel is ranked in the top 30 countries according to GDP per capita. The Israeli state enjoys unrestricted access to European markets, and Israeli universities participate on par with European institutions in EU research council initiatives, while Palestinian academics and students face onerous restrictions on their movement. While most Europeans recall an image of a disaster stricken war zone when Gaza is mentioned, Israel conjures up images of a tourist heaven, holy sites, golden beaches, and bronzed party lovers. What warning does Gaza hold for us? The Israeli academic and activist Jeff Halper describes the situation as ‘warehousing’, a term commonly associated with the US’s disproportionate incarceration of African Americans ever since the abolition of slavery, and in spite of calls for civil rights. Warehousing refers to a geopolitical situation in which an unwanted population is considered ‘surplus’ to requirement and is even viewed as a threat to resource distribution. Short of all-out-genocide in response to the ‘unwanted’, warehousing has become a legitimate means by which racialised regimes of governance control and immobilise unwanted populations. Those warehoused remain ‘out of sight, out of mind’ until they start to protest or fight back, which turns them into legitimate targets for violent repression. Gaza stands as a painful testament to transnational warehousing strategies. In 2012 it came to light that the Israeli military administration had put the residents of Gaza ‘on a diet’ between 2007 and 2010, a euphemism for restricting caloric intake while keeping the nutritional situation in Gaza from being declared ‘a humanitarian disaster’. This programme, which ran contrary to the international legal and humanitarian obligations of an occupying power—the Gaza Strip remains under Israeli occupation despite the latter’s withdrawal of troops in 2007, for reasons explained by Noura Ereket and Lisa Hajjar at Jadaliyya—was facilitated by the strategic deployment of double-speak. Each military operation has been described as a ‘war’, and yet Gaza is not a state, and there is no independent Palestinian state in 2015. The Palestinians in the Gaza Strip, West Bank and Israel are severed from each other by Israel’s complex matrix of control which restricts population movement and discourages family reunifications. Israel’s settlement expansion into occupied Palestinian land is further ensuring that a legal and just solution is an ever distant prospect. In such a situation, warehousing, and the political and military violence characterising it, becomes the norm. But the cost of warehousing can only be borne out if the humanity of the warehoused is denied, and it begs the question of whether it is possible to remain human when one’s wellbeing requires the permanent dehumanisation of others? While I would caution against simplistic comparisons between the Palestinian and African American struggles for freedom and justice—one rooted in a history of settler colonialism, and the other in the legacy of the transatlantic slave trade—it is worth noting that the Israeli state is fond of ‘borrowing’ tactics from the US as it attempts to ‘manage’ unwanted Palestinians. ‘Warehousing’ has become a globalised tactic of the transnational prison-industrial complex. It is furthermore a prime example of a racialised governance system that seeks the total control over a population deemed not entitled to, and incapable of, exercising freedom. As Dylan Rodríguez elucidates in his article on the logic of the US prison system, the ‘racial chattel logic’ characterising the contemporary prison has a long history in ethno-supremacist state-building; ‘warehousing’ as Klein’s warning of a creeping ‘disaster apartheid’.